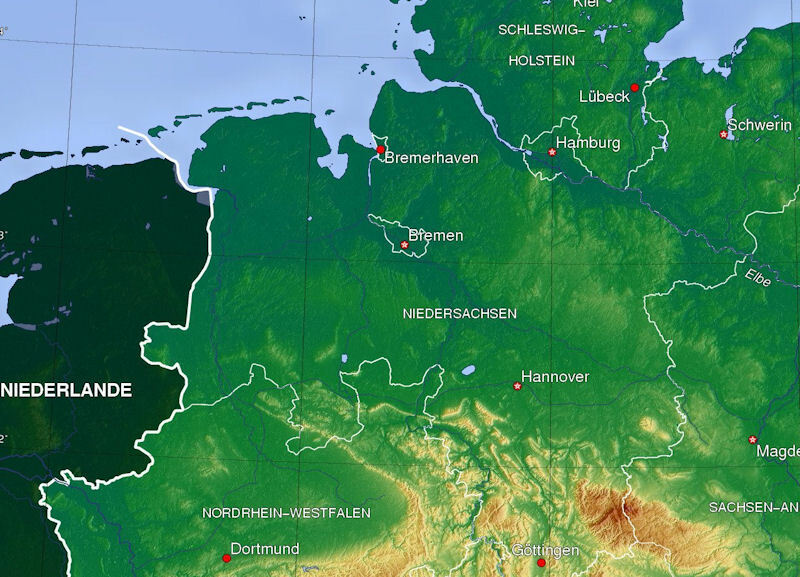 The North German Plain, or Northern Lowland, one of four physiographic provinces in Germany, covers approximately one-third of the Federal Republic of Germany and is characterized by landforms that have developed almost exclusively in glacial deposits. It is primarily a region of moraines and glado-fluvial sediments. Soils in this area are generally coarse grained sands and silts with isolated occurrences of fine grained and organic soiis. Drainage in the area consists of the Aller, Wesser, and Elbe Rivers, and their tributaries, which drain into the North Sea. 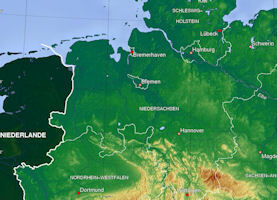 Northern Germany is a lowland, broadening toward the east until it merges into the plains of Russia. In the neighborhood of Holland the plain is very low and flat: but in most places, owing to the irregular deposits left by the Scandinavian glaciers, it is rolling. Elevations in this part of Ger- many rarely exceed six hundred feet. The topography is generally flat to rolling with local differences in elevation between 75 and 150 meters (250 and 500 feet) above mean sea level. Slopes are usually less than 10 percent, but can be as steep as 45 percent on isolated landforms. The North German Plain generally affords good cross country movement during the dry months. However, numerous marshlands, peat bogs, canals, small streams, and an extensive network of drainage ditches are common obstacles to off-road mobility. The entire North German Plain region is drained by the Weser or its principal tributaries tne Leine, the Fuhse and the Alier Rivers. Even with the extensive network of ditches, it is not drained well enougn to dry out all of tne swamps and bogs in the area. Yet, especially on the nigh southern side of this route there is much fertile soil, predominantly loess, devoted to farming. The North-German plain presents little variety, yet is not absolutely uniform. A row of low hills runs generally parallel to the mountain ranges to the South, at a distance of 20 to 50 miles to the north. To these belongs the Upper Silesian coal-basin, which occupies a considerable area in south-eastern Silesia. North of the middle districts of the Elbe country the heights are called the Flaming hills. Westward lies as the last link of this series the Luneburger Haide or Heath, between the Weser and Elbe, north of Hanover. Before the Great War, Prussia lay for the most part in the northern lowland of Germany and embraced two-thirds of the entire area ol the empire. Cold War division into East Germany did not divide the Plain itself. A second tract of moderate elevation, sweeps round the Baltic in the former GDR, without, however, approaching its shores. This plateau contains a considerable number of lakes, and is divided into three portions by the Vistula and the Oder. The most eastward is the so-called Prussian Seenplatte. Spirdingsee (430 feet above sea-level, and 46 square miles in area) and Mauersee are the largest lakes; they are situated in the center of the plateau. Some peaks near the Russian frontier attain to 1000 feet. The Pomeranian Seenplatte, between the Vistula and the Oder, extends from S.W. to N.E., its greatest elevation being in the neighbourhood of Dantzic (Thurmberg, 1096 feet). The Seenplatte of Mecklenburg, on the other hand, stretches from S.E. to N.W., and most of its lakes, of which the Miiritzsee is the largest, send their waters towards the Elbe. The finely wooded heighte which surround the bays of the east coast of Holstein and Schleswig may be regarded as a continuation of these Baltic elevations. The lowest parts, therefore, of the North-German plain, excluding the sea-coasts, are the central districts from about 52° to 53° N. lat., where the Vistula, Netze, Warthe, Oder, Spree, and Havel form vast' swampy lowlands (in German called Bruche), which, during the 19th Century, had been considerably reduced by the construction of canals and by cultivation, improvements due in large measure to Frederick the Great. The Spreewald, to the S.E of Berlin, is one of the most remarkable districts of Germany. As the Spree divides itself there into innumerable branches, enclosing thickly wooded islands, boats form the only means of communication. West of Berlin the Havel widens into what are called the Havel lakes, to which the environs of Potsdam owe their charms. In general the soil of the North-German plain cannot be termed fertile, the cultivation nearly everywhere requiring severe and constant labor. Long stretches of ground are covered by moors, and there turf-cutting once formed the principal occupation of the inhabitants. The greatest extent of moorland is found in the westernmost parts of the plain, in Oldenburg and East Frisia. The plain contains, however, a few districts of the utmost fertility, particularly the tracts on the central Elbe, and the marsh lands on the coast of Holstein and the north coast of Hanover, Oldenburg, and East Frisia, which, within the 18th and 19th centuries, the inhabitants had reclaimed from the sea by means of immense dikes.